I guess they prefer you do it Inside the office. Two words on Wordless Wednesday...Thank You from the bottom of my heart. Ok, maybe eight. 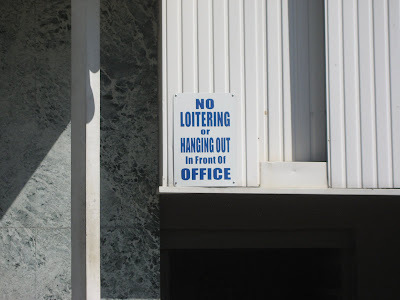 Okay, if I'm going to "hang out", or loiter for that matter, I'm sure not going to stick around the office to do it! Loitering is hanging out. I just found it funny that they felt the need to define that word. FringeGirl, you hit exactly on what I found most entertaining about this sign! My sister, Mom and I just laughed and laughed. Jan, you skateboarders are everywhere! ha! Can I come loiter in your shop? Check out our blog for the award we're giving you! Funny! I guess they wanted a sign that would be understood by all ages. Adults, you can't loiter here. Kids, you can't hang out here. I'm embarassed to say I had to read it twice to get it...hum, maybe it was made for the likes of me. Stop on back to Junk Camp...you got your days a little mixed up...you still have time. Relax, you must have too much on your mind. I don't want you to miss out!